Teletalk 1424 MB Internet 24 TK! All Teletalk Prepaid Internet users are Eligible to Buy Pohela Boishakhi offer 2017 . Now 1424MB @ 24TK 3G Internet Pack also get 1424 seconds for onnet talk time . The Customer can enjoy 3 Days Validity of this Teletalk Pohela Boishakh Offer 2017. Teletalk Customers will be used the desired Internet in the 3G Network or 2G Network. You can also see Teletalk Internet Package. 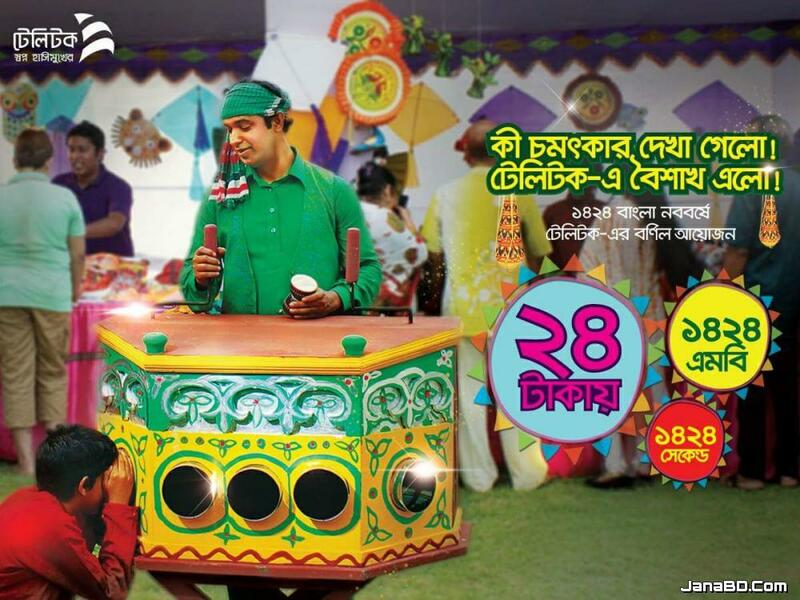 ▶All Teletalk prepaid subscribers are eligible to avail this Pohela Boishak Offer. ▶Teletalk 1424 MB Internet and 1424 Sec Minutes at 24 Tk. ▶The price of the offer is Tk. 24 (Including VAT, SD &SC). ▶Subscriber can avail this offer by dialing *111*62# or type P24 and send SMS to 111 (free of charge). ▶The campaign period will be 05 days starting from 00.01 AM of 13 April, 2017 to 11.59 PM of 17 April, 2017. ▶Subscriber can take this offer as many times as s/he wishes during the campaign period. ▶The usages validity of 1424 seconds voice and 1424MB data will be 3 days including the activation date. ▶The usages time of 1424 seconds voice and 1424MB data is for 24 hours. ▶Unused voice and data will not be carried forward to the next period. ▶After the expiry of validity period subscribers will be charged pay per use data rate (Tk. 0.01/30 KB). ▶To check usage type U and send SMS to 111.